Marine Exhaust Systems has hired Mark of Transportation. AMP said in a pre- Homeland Security. A Master Mari- pared statement, “With vast experi- ner, he was also recently named Vice Brown for technical sales. 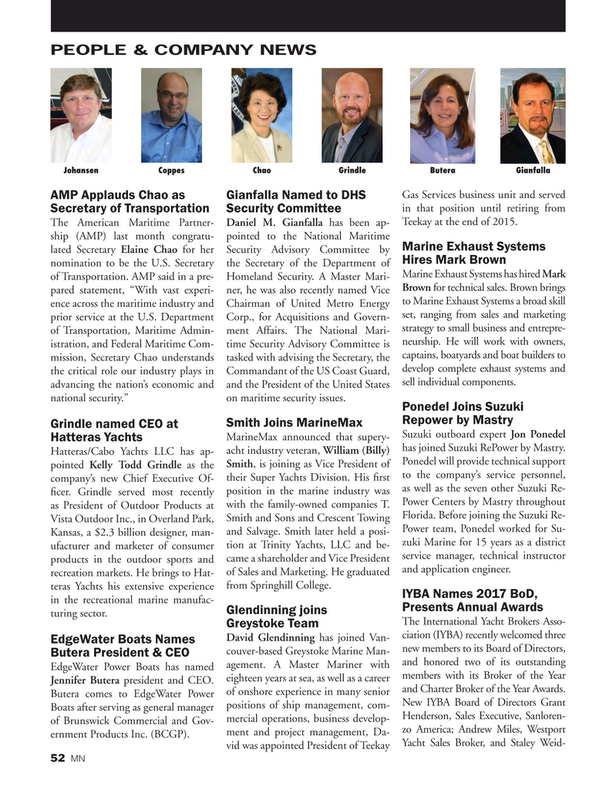 Brown brings ence across the maritime industry and Chairman of United Metro Energy to Marine Exhaust Systems a broad skill set, ranging from sales and marketing prior service at the U.S. Department Corp., for Acquisitions and Govern- strategy to small business and entrepre- of Transportation, Maritime Admin- ment Affairs. The National Mari- istration, and Federal Maritime Com- time Security Advisory Committee is neurship. He will work with owners, mission, Secretary Chao understands tasked with advising the Secretary, the captains, boatyards and boat builders to the critical role our industry plays in Commandant of the US Coast Guard, develop complete exhaust systems and advancing the nation’s economic and and the President of the United States sell individual components. national security.” on maritime security issues. Hatteras Yachts acht industry veteran, William (Billy) has joined Suzuki RePower by Mastry.